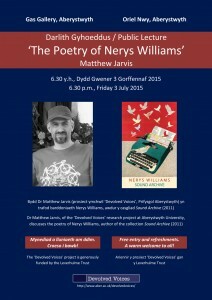 Matthew Jarvis will be giving the next of his Devolved Voices public lectures on Friday 18th September, at 6.30pm, in the Gas Gallery, Aberystwyth. His subject in this session is the poetry of Meirion Jordan, author of Moonrise (2008; shortlisted for the 2009 Forward Prize for Best First Collection), Strangers Hall (2009; winner of the 2009 Norfolk Commission prize and shortlisted for the 2009 East Anglian Book of the Year) and Regeneration (2012). Full details of the event can be found here (and also, as a Facebook event, here). Please do come along – entry is free. 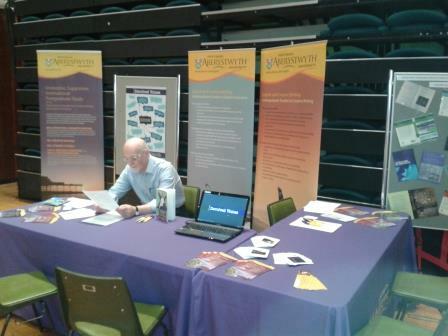 There was a Devolved Voices presence at the Aberystwyth University ‘Access All Areas’ day this last Saturday, with two of the team – Peter Barry and Matthew Jarvis – staffing the stall for the Department of English & Creative Writing. We had a busy afternoon, talking to people of primary school age and upwards. The activity that we’d arranged was a sort of poetry game – specifically a ‘cloze procedure’ task, in which words have been taken out of a poem so that participants have to decide which words should be chosen to fill the gaps. (The two poems that we used were by Jonathan Edwards, from his Costa Poetry Prize-winning collection My Family and Other Superheroes.) It was fascinating to see quite how much this gave us a chance to explore a whole range of ideas around meanings, rhythm, and register. And it was great to see people engaging so enthusiastically with poetry. Our thanks go to the Department of English & Creative Writing for asking us to be their representatives. And to Aberystwyth University themselves…who very helpfully put us just across the room from the chocolate fountain, which kept a steady flow of people coming past our own stall. Chocolate then poetry – what’s not to like?! 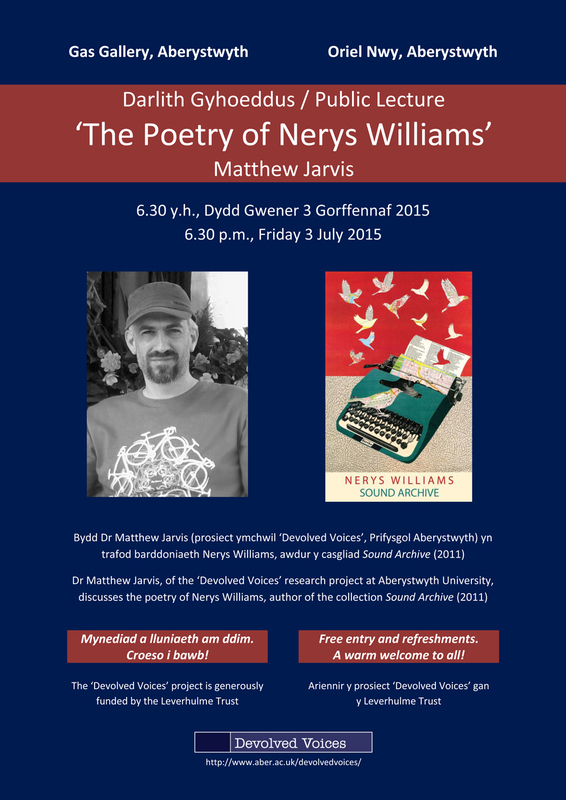 Dr Matthew Jarvis, researcher on the Devolved Voices project, will be delivering a lecture on the work of 2013 Wales Book of the Year winner Rhian Edwards at Founders Library, Old Building, Lampeter Campus, University of Wales Trinity St David, on Thursday 18th June at 6.30pm. This event is free – and all are warmly welcomed. Some extracts of work by Dr Matthew Jarvis are now available on our website. The first, an extract looking at Jonathan Edwards’s poetry of place, comes from Dr Matthew Jarvis’s recent lecture on the Costa Prize-winning poet’s My Family and Other Superheroes. The second, looking at the work of Dai George – ‘Poetry and the 99%’ – comes from ‘Devolutionary complexities: reading three new poets’ which is planned to appear in the volume Matthew Jarvis, ed., Devolutionary Readings: English-Language Poetry and Contemporary Wales, to be published by Peter Lang in 2016, as part of their Modern Poetry Series. The book will bring together a dozen essays, by a range of scholars, about post-1997 English-language poetry in Wales. Alongside Matthew’s book, I will be editing, in the same Modern Poetry Series, a selection of interviews with post-1997 poets under our Devolved Voices focus, which will also appear next year. PDFs of the extracts are provided at the bottom of their web pages. 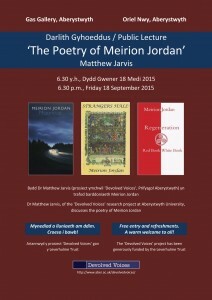 Dr Matthew Jarvis delivered a lecture on the poetry of Jonathan Edwards at The Bookshop, Aberystwyth Arts Centre on 28 May 2015. The lecture, entitled ‘Family and Community: The Poetry of Jonathan Edwards’, can be found at this link on Soundcloud or at this link on YouTube. The event also included Jonathan reading from a selection of his work beforehand. With thanks to Simon Williams for the recording. 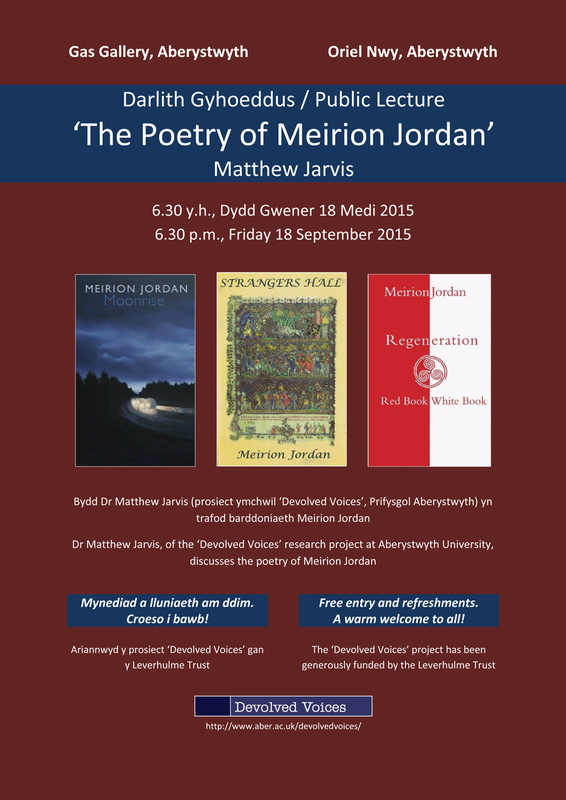 Dr Matthew Jarvis, researcher on the Devolved Voices project, will be delivering a lecture on the work of 2014 Costa Poetry Award winner Jonathan Edwards next week. Introduced by Professor Peter Barry, the lecture will take place at The Bookshop, Aberystwyth Arts Centre, on May 28 at 6.30pm. This event is free – and all are warmly welcomed. Lots of students want to do dissertations on ‘the changing role of women’, and the gender switch seemed a refreshing notion. So I was ready to suggest three representative poetry collections by men through which the changing ‘role’ of men would be evident across the contemporary period, meaning from roughly 1970 till now. These are the three I came up with, with a gap of about twenty years between each one: firstly, Douglas Dunn’s Terry Street (Faber, 1969), in which the male speaker is a student lodger in a working-class street in Hull, observing family life in a detached way (men going off early to work, women pushing prams, going to the shops, coming back from a night out, and so on). Secondly, Don Paterson’s Nil Nil (Faber,1993), in which the persona clings to the Dundee working-class roots which his education pulls him away from, and writes with fierce and angry tenderness about his father teaching him how to drink a bottle of pop (in ‘Heliographer’) or being patronised by a Hi-Fi salesman (in ‘An Elliptical Stylus’). And thirdly, one of our ‘Devolved Voices’ poets, Jonathan Edwards’, My Family and other Superheroes (Seren, 2014), which recently won the Costa Poetry Prize. In this book the family is embraced, celebrated, and choreographed as a kind of limitless resource of chaotic and surreal energies, and the father poems are tender without the angst, as this poet too learns how to handle fizzy drinks while cozied up in the dark of the cinema with his father – ‘I sit here in the darkness with my father/ slurping Pepsi’ (the opening of ‘The Death of Doc Emmett Brown in Back to the Future’). Certainly the ‘role(s)’ of men have been changed and pluralized, and, yes, it’s there in the poetry. Two questions: (1) is it a coincidence that all these books are debut collections? And (2) What would be your three poetry collections from the same period on this topic? Jonathan Edwards, who was recently interviewed by Devolved Voices, has been shortlisted for the Costa Book Awards 2014 (Poetry Category). Jonathan, a 2014 poetry debutant with My Family and Other Superheroes from Seren, is shortlisted alongside well-established talents Lavinia Greenlaw (for A Double Sorrow, Faber), Kei Miller (for The Cartographer Tries to Map a Way to Zion, Carcanet) and Colette Bryce (for The Whole and Rain-domed Universe, Picador). You can view our interview with Jonathan here.